It has become an inevitable fact that global problems centering on water resources are pervasive and moreover represents an existential problem for more than 1.5 billion people. Water related problems affect political relations, public health, agriculture, development, and environment. Particularly important examples (Colwell, 2002)  can be related to transboundary rivers, overuse of water resources, lack of access to safe water, lack of adequate sanitary facilities, insufficient water management to reuse and to recycle industrial and municipal wastewater or increasing water needs in settings of inadequate water supply. Long-term climate change and population growth will further stress water resources in many regions worldwide. In view of this context and to meet the 21st century’s problems of academic education and skills in sustainable water management the indispensible demand is to conceptualise an integrated master curriculum across the disciplines to meet the complexity of water issues. In 2000, the World Commission on Water stated that a holistic, systemic approach, relying on sustainable water resources management had to replace the fragmentation in managing water issues. To reach this goal, a new paradigm for interdisciplinary graduate education is urgently needed. The founding principle of a SWM graduate programme should be also to include all disciplinary perspectives relevant to water management. Water management is recognized as socio-economic, institutional, and ethical challenges as much as it is a biological, chemical, and engineering one. Thus SWM graduate programmes should be open to all relevant disciplines and be dedicated to educating people skilled in one discipline who can use multiple disciplinary perspectives and tools at the outset of the analysis of water problems. Graduate programmes must also emphasize the need for teamwork to develop solutions jointly using the rigorous methods and tools that come from the array of disciplines needed to solve such problems. While a solid grounding in one discipline is needed to participate effectively in SWM, students must also have rigorous exposure to the range of methodological tools used by different specialities. In 2009 the Exceed project started developing an Exceed partnership network, which is currently consisting of 35 partner universities and research centers on 4 continents. Within the frame of capacity building one main focus was set on the formulation of a model master curriculum on sustainable water management. The model curriculum is used to serve as an orientation guide to adapt or refine current or future master curricula at partner universities. Though, the pre-condition was to initially develop a curriculum database (Figure 1) providing Exceed partner universities the opportunity to upload and to store detailed information about the existing master courses. 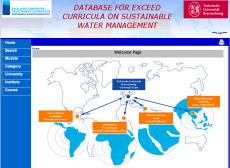 Meanwhile, the database contains more than 400 master courses and is now serving as the basis for (i) providing master students with useful information, before having decided or applied for scholarship, and moving to another Exceed partner university and (ii) serving as data pool used to carry out analyses and to develop a model master curriculum structure on sustainable water management at partner universities. In Figure 2, the overall percentaged proportion of advanced and introductory courses, and joint group work of the model master is given. The percentaged distribution offers the opportunity to easily adapt the workload and extent of courses to be allocated to the respective course level and group work. 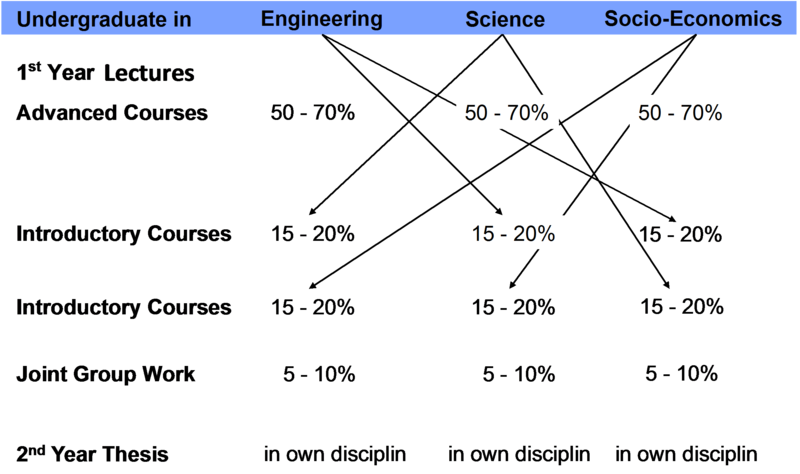 Figure 2: Percentage of course distribution within the catagories “advanced” and “introductory” course, joint group work, and master thesis according to the educational focus of the entering undergraduate student. Colwell, R. (2002). ‘‘A global thirst for safe water: The case of cholera.’’ Abel Wolman Lecture,NationalAcademy of Sciences,Washington,D.C., January 24.